Recap On Aug 27th I wrote a detailed report about my July 20th high speed car accident, so if you missed that and you want the info click on the embedded link. My days since returning from Gender Camp (Aug 9-15th) have been dominated by the following MRI image of my neck injury from the High speed car accident. Understanding this MRI, involves trying to actually comprehend how an event that lasted less than 5 min has altered the rest of my life. When I went to my scheduled appointment with my Prinary care physician Dr. Joanna K. May on Aug 16th. She told me that I needed to have an emergency surgery to address what this MRI showed. She advised me not to drive and asked me to get someone to pick me up. I was alarmed and confused. The condition occurs when the disc’s outer layer (annulus) gets a large enough tear to enable the inner gel layer (nucleus) of the disc to leak out and potentially irritate the nearby nerve. If the nerve is affected, neurological symptoms such as pain and weakness can radiate down the path of the nerve into the arm and/or hand (cervical radiculopathy). I am experiencing burning pain in my neck and pain and numbness that radiates down my shoulder and along the nerves in my right arm resulting in numbness in my palm and middle finger. one of the tricky things about this is that my pain tolerance is very high due to the chronic pain I am used to having from arthritis in my knees, hips and lower back. My ability to tolerate a high amount of pain makes it difficult for me to assess how severe the suden occurance of arm and neck pain and hand/finger tingling and numbness I am having is. 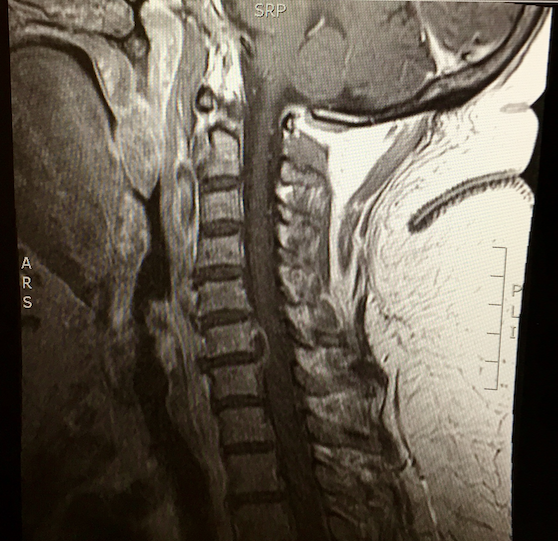 It is also possible that I have and may be developing spinal stenosis with myelopathy, in other words the bubble of nucleus pulpous, is pressing on my spinal cord and causing nerve damage which, if is not operated on quickly can cause permanent damage to the effected nerves. Recommended courses of action: I am to seriously restrict my activities, wear a cervical collar, and limit all exposures to possible further shocks and potential abrupt jarring of my neck. If I continue to experience the radiating pain and numbness in my arm and hand, and/or a number of other symptoms show up (its a long list, I won’t type it up here) that indicate nerve damage emerge, I should get surgery ASAP to avoid having permanent nerve damage. I saw two seperate surgeons last Tuesday and Wednesday to get their consultations on what surgery might entail. The OHSU surgeon suggested an Anterior Cervical Discectomy Fusion (ACDF) you can see a video about this surgery on www.spine-health.com . It is extensive and includes a bone graft (possibly from my hip) and would include completely replacing vertebrae C6 AND fusing it to C7 and C5 with metal. Surgeon and MD Jordi X. Kellogg gave me a very thorough examination and recommended a laproscopic surgery that would remove only the damaged disc and insert a stainless steel disc replacement. I bet you can guess which surgery I would prefer. However, both surgeons began the consult with the phrase, “You don’t want this surgery” because it is high risk surgery performed right next to the spinal nerves on the spinal column. A mistake in these surgeries could lead to paralysis and permanent spinal damage or death. Wow, right? So what is the alternative to surgery? In 50% of the cases the herniated disc can correct itself through the mysteries of the body and ??? Divine intervention. My job during September is to assess whether or not I can encourage my body to heal on its own. What am I doing? Telling you and everyone I know to send me healing energy and hold me in their prayers. I am open to long distance and in person reiki, laying on of hands and full blown healing rituals. I am geting massage 1-2 a week, taking a large number of supplements and Chinese Herbs. I am receiving acupuncture and treatment from Mitch Stargrove of WellSpring Natural Health ( why not get the best Naturopathic treatment from a ceremonial magician I thought, so I am). I am swimming without bending my neck 3-5 times weekly. Alena Braud moved into our house temporarily to be my personal care assistant and I was able to increase my paid help through DHS for this. The surgeons agreed that I am doing the most I can and that I should contact them at the end of the month to see if I want to set up surgery or go on with my life in a pretty severlly curtailed fashion indefinitely. So that is where I am at. Typing on the computer aggravates my pain levels so I am going to stop here. Please do call or email me with your good intentions. It is especially important for me to hear from you if you have benefited from my presence in your life. Appeciations and acknowledgements of my positive impact on you past or present would be helpful. Having this level of pain daily has been depressing and frustrating and has caused me to begin more rigorous planning for a conscious and sovereign death process.